While this question often leads to follow up questions, nine times out of ten they are polite. People have opinions about homeschooling. They just do. They always knew a weird kid who homeschooled. They wonder if your kids ever see other kids and how they can possibly learn math. They wonder, out loud and right in your children’s faces, how you deal with them all day (And while we are on this one…please, even if you’re thinking it, don’t say it. It’s rude. I happen to like my kids most days, thankyouverymuch.). 1. Let the results speak for themselves. Honestly, this is going to be less with cashiers and more with the constants in your life. You know why you’ve made this choice for your family, and sometimes you simply have to rest in that and give the outcome enough time to show itself. If you and your kids are settled in and doing what works best for your family, it’s going to show. 3. Use the opportunity to educate. I’m a touch sarcastic by nature, so sometimes when I’ve had the same conversation multiple times, I will dream up a response with a smattering of snark. But. I stop myself and remember that, at best, this could be a chance to clear up someone’s misconception. Having a few general statements about the benefits of homeschooling can be great in these situations. Even if you don’t, a kind response to the occasionally hostile inquisitions will never hurt your cause. You never know who is listening! How does your family handle the back to school barrage of questions? 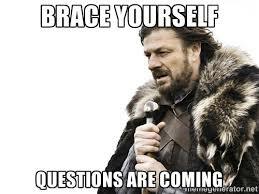 What’s the strangest homeschool related question you’ve been asked?